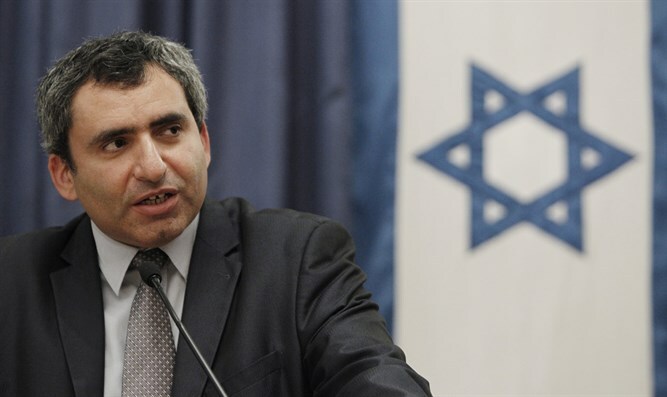 After trailing secular candidate in polling for upcoming mayoral election in Jerusalem, Likud minister Zeev Elkin regains narrow lead. With roughly two months left before Israel’s local elections, the Jerusalem mayoral race remains tight, with a run-off vote likely between the top two candidates. According to the latest poll, conducted by the Dialog polling firm on behalf of the Elkin campaign, Minister Zeev Elkin (Likud), who currently holds both the Jerusalem Affairs and Environmental Protection portfolios, is in first place, after trailing city councilman Ofer Berkovitch in another poll earlier this month. In the new survey, Elkin leads in a seven-way race with 31.9%, compared to 24.6% for Berkovitch, and 20.3% for United Torah Judaism’s Yossi Deutsch. In a distant fourth place is Moshe Leon, who in 2013 ran on the Likud ticket against incumbent mayor Nir Barkat, with 13%. MK Rachel Azariya (Kulanu) would win just 5.8% of the vote, the poll shows, with the remaining candidates winning less than 3% of the vote each. In the previous poll, Berkovitch, who heads the Hitorerut B’Yerushalayim party (‘Wake Up Jerusalem’) and has campaigned against haredi demands for the closure of popular tourist hotspots and movie theaters on the Sabbath, narrowly led the pack with 26.9%. The new poll also shows that in the event of a run-off between the top two candidates, Elkin would easily defeat Berkovitch by a margin of 61.2% to 38.8%.